And live life OFF the edge. And try to make you laugh. And you won’t want to stay. …the joys of life’s journey. This time I feel a change in store. To rhyme my posts from now on in. I might just draw to tell of me. I do so from our brand new dwelling! Now wasn’t that a tale worth telling? And towards South Buckinghamshire did roam. But thankfully we did the biz. We Christmassed here with much delight. The rest I’ll tell you soon. Night night! As I sit, I should be doing one of three things. One. Play with smallest one. Who, devoid of better things to do, is systematically going through the moving boxes I have packed, removing items she likes the look of, and subsequently eating them or destroying them. Hmm. There’s a lesson in there somewhere. Two. Go through all the papers that are surrounding me. I got halfway with this a few days ago before I was sidetracked. Then smallest one found them and jumbled them all up again. Hmm again – is this the same lesson as before, perhaps? Three. Go and clean the kitchen. I’ve been so busy trying to make some progress with the move that I haven’t done a thing to the kitchen (save clear and wipe the table before meals) for around 48 hours now. And we’ll not think about the things I should be doing after that. What I should not be doing, is blogging. Yet…here I am. In that kind of a mood where words flow off the tips of my fingers and refuse to stop till the RSI I once banished returns in full flood. Now smallest one has found a rice cake. 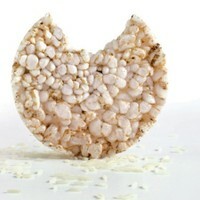 There should not be rice cakes around. This is quite likely a rice cake that fell to the floor yesterday or even earlier. OK. I really had better and tidy up before someone gets ill. Later, folks.